Why is it that when we take a vacation with the kids, it feels like I’m packing half the house to take with us? Do you feel that way too? Thank you to my best friend @Missusbig for the uber fitting photo! 1. Because baby things are bulky. 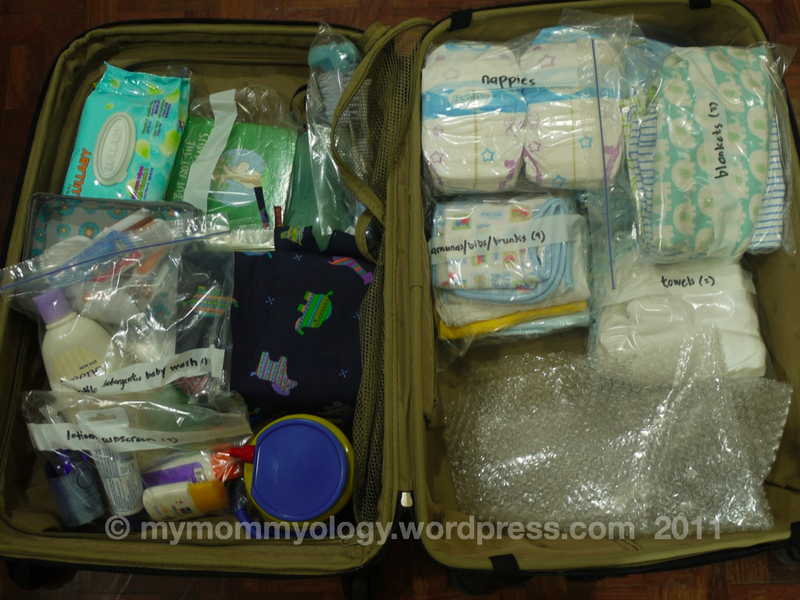 Diapers alone for a 3-day trip will take up a third of the suitcase. 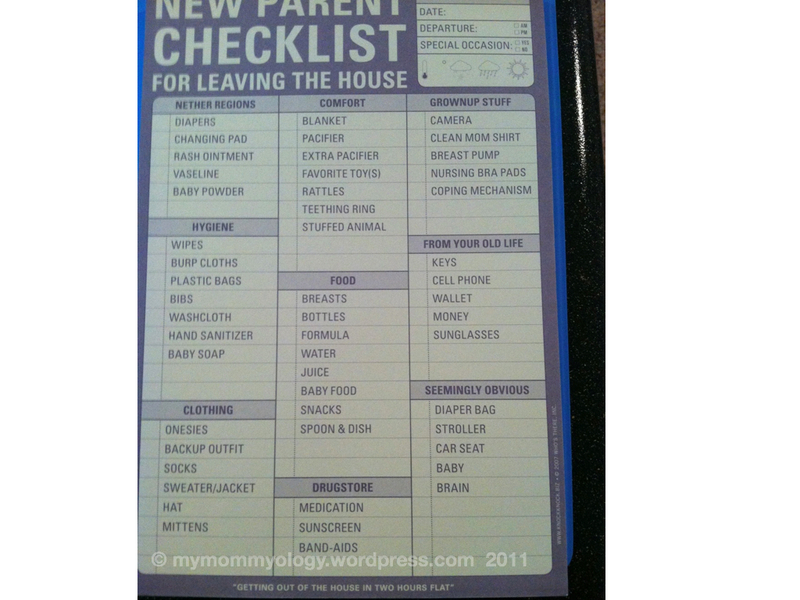 Not to mention if you a bring changing pad (like me), cotton balls and wipes (like me!) a ton of burp cloths (like me), and a towel for each child per day out (oh let’s see… yes I do that too! ), then it definitely fills up FAST. That’s just the “changing and cleaning” department. I also packed a breastpump and some bottles. I tried to cut back by not bringing a sterilizer or a bottle warmer, because Jamie would be with me the whole time anyway, and so I really just needed to pump and dump. I could sterilize when I got home. 2. You prepare for the worst. The thermometer, the infant Tylenol, the saline spray and aspirator, the Lysol on-the-go, the Tide Stain Release on-the-go, medicines for rashes, itchiness, cuts, bruises, band-aids, anti-bacterial cream, vitamins… the list goes on. Each child has their own grooming kit, set of toiletries and set of medicines. In addition to what is packed in the suitcase, I also always bring an “instant kit” in the day bag, coupled with miniature toiletries (baby wash, lotion, cotton balls, toothpaste and toothbrush), only because if we have an unforeseen accident, then I don’t have to pull out the entire suitcase to get us all cleaned up. 3. Like me, you don’t trust the disinfecting abilities of the staff that cleans the place before you arrive. So I bring our own Lysol Wipes, spray, alcohol, paper towels, plastic bags… the list goes on. My husband said that to save on clothes, we could use the washer dryer found in the unit that we were renting. I gave him a pointed look, because a) I didn’t want to be doing laundry on my vacation, and b) Knowing that someone else may have put God-knows-what in there before me, I would have cleaned and disinfected both first before I ended up using it. Then I would have packed our own laundry tools as well — forget it! 4. You can’t trust a toddler (or an infant) to keep their outfits clean all day / all night. For Jamie, it was more of a concern of spit ups and sweat than anything else, and boy did she do a lot of both! For Sam, well she is a toddler and that in itself says she will get sweaty, sticky, sandy, and over-all messy! Plus in terms of swimsuits, Sam is like me: if it’s wet or damp the next time we put it on, we don’t want to wear it again. So I had to bring several swimsuits for her, since I anticipated she would be going back and forth to the beach all day. Even if Sam didn’t need diapers, sometimes in all her excitement she’d forget she’d need a bathroom, and so I did have to bring more than enough underwear for her. 5. No matter where we are, we must keep some semblance of familiarity. The toys, the books, the comfort blankets and pillows — they all make the trip with us. Rationalizing and selecting which ones to take also takes time, and naturally Sam would want to bring everyone, even the small ones that can potentially get lost and cause me a lot of stress. There’s a set for the beach, a set for the car and a set for the hotel room too. Then I bring the Your Baby Can Read videos of Jamie and Sam’s Kumon homework — because we definitely can’t skip a day for these things (Oh no, I sound like Amy Chua!). Add in the gadgets and gizmos to record every moment of the weekend (Camera, phones, computers, tripods), some of the general beach things (blanket, umbrella, folding chairs, cooler), maybe a couple of canned goods (because what if the kids don’t like the food? That’s another headache altogether), snacks for the trip — and maybe, you’re just about ready. Doesn’t it make your head spin?! Then again, I always say — it’s better to overpack. There are more options for them, thereby decreasing incidences of tantrums, whines, and boredom, and somehow giving it a semblance of a vacation for you. That is me (us – since my husband has to endure my neurotic behavior when it comes to these packing situations) on a summer trip. Packing for a trip in the wintertime…? oh boy. I’ve done it with one — let’s see how we fare the next time around with two! The funny thing was we were about to leave that morning for the beach and my husband started loading the things in the car, only to realize he had not packed his things yet. I love the last statement: Getting out of the house in two hours. Ha! Oh epidural. What have you done to my brain?! Haha, I have decided not to think about it just yet. But I am already thinking about my seatmates and the bag carriers — GOOD LUCK TO THEM!! heehee! After reading this, I have decided we are not traveling for the next year! Haha. I know. Sometimes I even wonder why we leave the house at all! Hi! I am just doing some bIog-hopping and I cam across your blog. I actually found this post funny… only because I am officially done with it. :) My youngest is soon turning 7… BUT, do I remember those times when my kids were still THAT age. Yep! I need another car just to carry all the baby stuff. hahaha! With kids that age, it is always better to over-pack.